Join this fantastic safari in Uganda to see the stunning wildlife roaming here! During this safari, you will enjoy amazing game drives in the Queen Elizabeth National Park. You will get to see animals such as lions, Ugandan kobs, buffaloes, leopards, hyenas, elephants, and birds among other animals. Take this opportunity to travel in Uganda and explore the mighty Queen Elizabeth National Park! During this safari, you will stay either in a private or shared room at the Kazinga Channel View Resort, the Queen Elizabeth Safari Camp, the Simba Safari Camp, or at the Ihamba Safari Lodge. This resort is located in Katunguru along the Kazinga Channel, within the Queen Elizabeth National Park. The resort is one kilometer off the Kasese-Mbarara road. The elegantly furnished, spacious, and comfortable resort and bandas will have you feeling right at home. Here you will experience the wildlife first hand by meeting the animals that visit the resort such as buffalos, hippos, elephants, forest hogs, lions, hyenas, and baboons among others. All rooms are self contained. Also, the resort has a restaurant and bar, and different activities for you to enjoy such as the Kazinga boat cruise, nature walks, birdwatching safaris. The restaurant promises you a dine experience with exceptional personalized service. The Simba Safari Camp, renowned for excellent hospitality, is nestled atop a hill overlooking Lake Kikorongo on the edge of Uganda’s most popular park, the Queen Elizabeth National Park. The camp has panoramic views across the park’s extensive savannah plains teeming with wildlife as well as Lakes George and the famed Kazinga Channel. It is the closest accommodation to Queen Elizabeth’s Kasenyi plains on the edge of Lake George, the famed mating grounds for the Uganda Kobs and thus the most preferred area for game viewing drives. 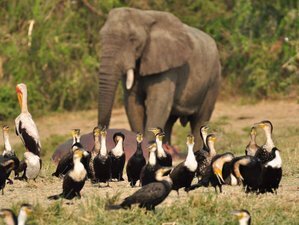 It is also closest to the other areas of northern Queen Elizabeth National Park, including the Mweya Peninsula and the Kazinga Channel, well known for launch cruises, close range game-viewing as well as bird-viewing. The accommodations have a common living room and shared bathrooms. Rooms also have wall fans for warmer days, a lounge seat, a verandah with two canvas chairs, hot and cold showers, and a clothing rack. All beds are fitted with a mosquito net. Other amenities include, an extensive lounge, a well-stocked bar, restaurant serving excellent continental dishes, and free Wi-Fi in the public areas. The Ihamba Lakeside Safari Lodge is situated on the shores of Lake George in Queen Elizabeth National Park, Muhokya sub-county, near the Kahendero village. Born out of love for nature and animal preservation, this lodge is a perfect location for those who want to experience the tranquility of unspoiled Africa, untouched by mass tourism. The lounge comprises a dinning and bar and a sitting area. The lounge also boosts a variety of African art crafts including drums, harps, and board games which guests can try out. Meals are served in the spacious dinning area overlooking the magnificent Lake George in order to deliver a relaxing and comfortable feel of the Lake breeze as the sun sets calmly over the horizon. All guest may also enjoy the use of a swimming pool and an ample and secure parking along with services such as house keeping and laundry services. Also, this lodge reserves exclusive, private accommodation consisting of African styled suites with extensive living areas overlooking the magnificent Lake George. All rooms contain full en-cottage facilities, private decks, and an indoor shower. The bathrooms boast large glass windows which offer a unique game viewing of the breathtaking Lake George. Sweeping vistas over the savannah and ever active water hole can be enjoyed as well. Drinking water and slippers are also part of the rooms facilities along with a working desk. On the first day, a Ugandan safari guide will meet you in Kampala and drive you to the Queen Elizabeth National Park to start this wildlife safari experience. The journey will start from Kampala at 6:00 a.m. On your way to the park, you will have a stopover where you may explore the surroundings to take some photographies or shop some crafts if you may. Then you will continue to the park until you reach your venue in time to check-in and have lunch at your lodge. After lunch, you will go for a boat ride along the Kazinga Channel to the shores of Lake Edward. Hippos, buffaloes, elephants, waterbucks, and water birds are commonly sighted along the channel which joins the two lakes. Once this safari is over, you will return to your lodge for a relaxed dinner and overnight. After dinner, you may request a night game drive for an additional cost. During the second day, you will wake up for an early breakfast before you go out for a game drive to search for the early risers. Your safari guide will drive through the Kasenyi track where you will see the big cats active on their daily hunts. You will also spot out animals such as lions, Uganda kobs, buffaloes, leopards, hyenas, elephants, birds, butterflies, and the characteristic savanna trees. Next, you will have lunch at your hotel. After lunch, you will go back to Kampala so you may reach it in the evening. This will mark the end of this safari. This safari will be held at Queen Elizabeth National Park in Uganda. Uganda, the Pearl of Africa, boasts of an amazing wildlife. From mountain gorillas in the tropical rainforests of Bwindi and Mgahinga National Parks to the renowned tree climbing lions in the Ishasha Sector of Queen Elizabeth National Park, Uganda has a variety of wildlife that has made it an exciting adventure destination in Africa. Uganda’s national parks also have spectacular landscapes. Queen Elizabeth National Park got its name in 1954 when it was named after Queen Elizabeth II after her visit. The park covers an estimated area of 1,978 square kilometers, of which 50% of it lies in the Bushenyi district, 33% lies in the Rukungiri district, and 33% lies in the Kasese district. Queen Elizabeth National Park is Uganda’s most visited national park. Its diverse ecosystems, including sparkling lakes, fertile wetlands, savanna, shady and humid forests make it an ideal habitat for over 600 species of birds and over 95 mammal species such as a huge range of primate species like chimpanzees, lions, and hippos. The park is situated on the sides of Mountain Rwenzori, and is also well known for its volcanic activity, with enormous crater lakes. Salt is extracted out of one of these crater lakes, Lake Katwe. In here, you will also discover how local people mine the salt using their own hands. This salt lake marks its highest point at 1,350 meters above sea level. At the heart of the park there is the Kazinga Channel which banks are always lined with hippos, buffaloes, and elephants. The Ishasha Sector is home to the famous tree climbing lions, which always wait for the easy meal like antelopes. The culture of Queen Elizabeth National Park is the most intriguing. There are many opportunities for tourists to meet and interact with the local communities and enjoy their stories, music, dances, and more. You will be filled with awe when you visit this remarkable park. During this safari, you will be served daily delicious breakfast, lunch, and dinner. During your free time, you may book other tours or safaris available for an additional cost at any of the accommodation venues. You may also relax by the venues' facilities or explore the surroundings. Please book your flight to arrive at Entebbe International Airport (EBB). Transfer from and to this airport is available upon request for an additional cost of 50 USD per person per journey. Please let Arrive Africa Safaris know if you would like to take this option. Airport: Entebbe International Airport Airport transfer available: Entebbe International Airport (US$50 per person) Additional charges may apply. You can request this in the next step. Arrive Africa Safaris is one of the best gorilla safari companies in Uganda and Africa as a whole. They offer good and quality services to all visitors.